There has just been announced a fun contest by the Tolkien Team of HarperCollins. 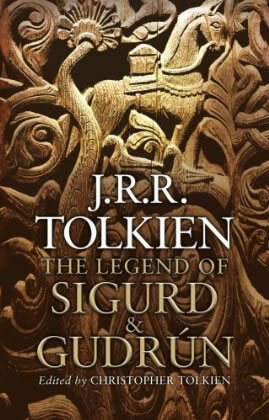 Here is your chance to win a Hobbit audio book on CD by just sending in your review of the latest Tolkien book The Legend of Sigurd and Gudrun. "We hope you are enjoying the latest edition to Tolkien's oeurve as much as we are. What did you think? We'd love to hear your thoughts about the book. Send your comments to us here and not only will we be including some of your views in our next newsletter, but 5 lucky people will win a wonderful Hobbit audio book on CD*." This is of course very exciting and I'm always in for a fun contest, hope to read all your views in the next HarperCollins Tolkien newsletter. Hope one of you wins an audio book! Most exciting was seeing that the email announcing the contest had been sent from the email news@tolkiennews.co.uk and now I hope they soon build a good Tolkien news site on that domain! 1. Entry is free. This promotion is valid until 31 July 2009. Registrations after this date will be excluded from this promotion. Responsibility cannot be accepted for entries which are not received by HarperCollins. Proof of sending is not proof of receipt. Your entry into the promotions is your acceptance of these terms. This competition is promoted by HarperCollins Publishers Limited of 77-85 Fulham Palace Road, London W6 8JB. 2. Employees of HarperCollins and their families are not permitted to enter the competition. One entry per person and one entry per household. 3. Winners will each receive prizes as specified on the competition page. The prize is non-transferable and HarperCollins reserves the right to provide an alternative prize of equal value in the event of unforeseen circumstances. 4. Participants need to send in their views to be entered into the prize draw. The winners will be picked at random from all entries received in accordance with the terms listed. By entering the draw the winner agrees to allow the free use of their name, photograph and general location for publicity and news purposes in connection with the Promotion. 5. The winners will be notified by email no later than 31st August 2009. If the winner cannot be contacted before this time HarperCollins Publishers reserves the right to re-draw a winner from the correct entries in accordance with these terms. HarperCollins' decision as to who qualifies as the winner is final and HarperCollins will not enter into any correspondence relating to the winning entry. 6. HarperCollins excludes all liability, so far as is permitted by law, which may arise in connection with this draw and reserves the right to cancel the draw at any stage. 7. Any dispute relating to this competition shall be subject to the laws of England and Wales and will be subject to the exclusive jurisdiction of the English Courts.